Drinking water comes from two major sources: groundwater and surface water. Groundwater is pumped from wells drilled into aquifers . Surface water is piped or pumped from lakes, rivers, and streams. Groundwater and surface water are part of the hydrologic cycle of precipitation, transport (runoff or percolation), and evaporation, and are almost always interconnected. The hydrologic cycle involves all of the Earth's water, but only 1 percent of the total water budget is fresh water suitable for drinking-water supply. Most fresh water is frozen within glaciers or ice caps and hence is essentially unavailable for human use. Consequently, protecting freshwater sources is critical to ensuring long-term availability of high-quality drinking-water supplies. Most drinking water, particularly in urban areas, is obtained through public water systems that serve multiple homes or entire communities. In rural areas, household drinking water is commonly obtained through private wells or surface-water intakes (such as streams and springs), and is usually called a "domestic" supply. Activities of the world's growing population have led to increasing threats to the quality and quantity of both public and domestic drinking-water supplies. The U.S. Environmental Protection Agency has estimated that more than 80 percent of all public drinking-water supplies in the United States have at least one potential source of contamination (pollution) within about 3 kilometers (2 miles) of the supplier's well or intake. Every drinking-water supply is vulnerable to pollution from a variety of sources. Contamination can come from industrial facilities, underground storage tanks, confined animal feedlots, septic systems, stormwater outfalls, sewage and waste disposal sites, managed forests, agriculture lands, and large accidental spills, as well as from day-to-day operating practices associated with small businesses and other residential-related activities in every community (e.g., the use of household and lawn chemicals). Contaminants that can potentially affect the quality of the source water supplying a public water system include microorganisms, inorganic and organic chemicals, and sediments. Contamination of waterbodies can occur on an area-wide basis or from a single point source. Area-wide or (nonpointsource) contaminants include sediments, nitrate, microorganisms, and pesticides. Point-source contaminants include volatile organic compounds , microorganisms, and petroleum compounds. Throughout many of the world's developed countries, availability of safe drinking water in desired quantities is taken for granted. 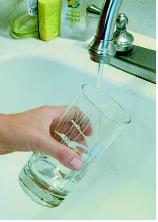 In the United States, for example, one need only turn a faucet handle to fill a glass. process, and thereby create chlorine by-products. Water storage and piping materials that are in direct contact with drinking water can also contribute contaminants such as lead and copper. Under current federal laws (such as the Safe Drinking Water Act) and state laws, public water systems must demonstrate through frequent water testing that the water they provide to their customers meets drinking-water standards. Although monitoring provides some degree of assurance of safe drinking water, it does not guarantee that the water will be safe in the future. Hence, various measures are taken to protect supplies and the public health. Because many types and sources of contaminants can affect drinking water, protecting water quality must be achieved through what is called the multiple barrier approach. Multiple barriers are important to drinking-water safety because no single barrier can be expected to provide full public health protection at all times and under all conditions. Multiple barriers include drinking-water source protection, water treatment, and water system management. The first barrier for safe drinking water can be gained by preventing contamination of the waters that serve as the sources of public water supplies. When a public water system becomes contaminated, it is expensive and timeconsuming to correct the problem. Alternative drinking-water supplies must be secured and residents often are forced to buy bottled water for daily water needs. Replacing the contaminated water system or treating the existing one will generally result in substantial increases in the community's water rates. Identifying and investigating the source of the contamination is expensive. The unknown costs of cleanup and/or treatment of the contaminated drinking water can result in lower property values and an inability to sell homes in the community. These costs provide ample incentive to protect the system from contamination in the first place. A plan designed to protect against potential contamination provides a level of safety beyond monitoring and treatment requirements. Drinking-water protection involves developing protection strategies for the groundwater or surface-water source areas. The U.S. Safe Drinking Water Act (SDWA) was amended in 1996 to include requirements for all states to conduct "source-water assessments" for each public water system . Sourcewater assessments are designed to provide information to the public about their individual drinking-water system.This information is used to develop a plan to protect a public water system. Providing a written report to ensure that the results are available to the public. Inventories are focused primarily on the potential sources of contaminants regulated under the SDWA. This includes contaminants with a maximum contaminant level (MCL); contaminants regulated under the Surface Water Treatment Rule; and microorganisms such as Giardia lamblia, bacteria, and viruses. The results of the assessments are made available to the public through the local public water supplier, Internet, or community libraries. The information in the assessments will provide each community and public water system with the basis for developing local protection strategies and plans designed to ensure the long-term safety of their public water systems. Identifying the land area that could contribute water and contaminants to the public water supply is a common way to delineate the protection area. For groundwater sources, information about the flow of groundwater is used to determine the area that contributes to the well during pumping. For surface water intakes on streams, rivers, or lakes, the land area in the watershed upstream of the intake is identified on a map as the source area. Inventories seek to identify potential sources of contaminants that could affect the public water supply. The inventory includes a list of facilities, land uses, or activities that may release contaminants into the groundwater or watershed. Some examples of the many different types of potential contaminant sources were listed previously in this entry: among them, underground storage tanks, waste disposal sites, residential septic systems, and confined animal feedlots. After identifying the protection area and listing the potential threats, strategies can be developed to reduce the risks of contamination to the public water supply, and establish a contingency plan for responding to future contamination incidents. Drinking-water protection is generally much more successful if it is built on the concept of "community-based protection." Community-based protection incorporates significant local citizen involvement and allows citizens to choose the exact protection strategies that are most appropriate for them to protect their drinking-water supply. Implementing regulatory, permitting, or land use controls through the local government. Through proper planning and implementation of strategies on multiple fronts, sources of public water supply can be protected, thereby contributing to the safety of drinking water. SEE ALSO Chemicals from Agriculture ; Drinking-Water Treatment ; Groundwater ; Land Use and Water Quality ; Pollution of Groundwater ; Pollution of Lakes and Streams ; Pollution Sources: Point and Nonpoint ; River Basin Planning ; Runoff, Factors Affecting ; Safe Drinking Water Act ; Stream Health, Assessing ; Supplies, Public and Domestic Water ; Watershed, Restoration of a ; Watershed, Water Quality in a ; Wells and Well Drilling. New England Interstate Water Pollution Control Commission. Source Protection: A National Guidance Manual for Surface Water Supplies. Lowell, MA: New England Interstate Water Pollution Control Commission, 2000. U.S. Environmental Protection Agency. State Source Water Assessment and Protection Programs Guidance. U.S. Environmental Protection Agency, Office of Water, EPA 816-R-97-009, August 1997. Zoller, Uri, ed. Groundwater Contamination and Control. New York: Marcel Dekker, Inc., 1994. Index of </safewater/dwinfo/>. EPA Office of Water. <http://www.epa.gov/safewater/dwinfo> . Potential Sources of Drinking Water Contamination Index. EPA Office of Water. <http://www.epa.gov/safewater/swp/sources1.html> .